3 - Wrist Rest 11 - Jel inside Synthetic Leather "Jel-LeatherRite"
Keyboard Comfort Above and Beyond. 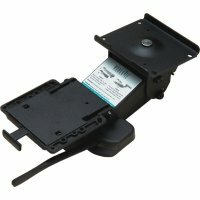 Whether you are outfitting one workstation or thousands, Workrite Glide moves to everyone's comfort level. Its limitless range of adjustability is out of this world. Engineered to exacting specifications, critical components are quality tested to be within one half the width of a human hair. This careful attention to detail continues with the selection of unique materials including a jet engine control component that ensures thousands of smooth adjustments for years to come. With 24 standard configurations, Workrite Glide will meet the needs of workers around the clock and around the globe. 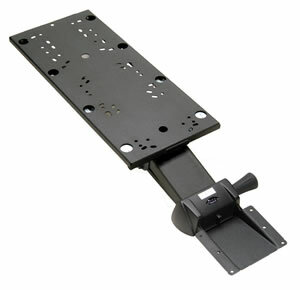 We've combined our best keyboard platforms with our most popular adjustable arms to give you five superior solutions. These versatile systems are available on our QuickShip program. The average professional workweek has steadily increased over the last 10 years as hyper-productivity progressively dominates the mindset of most companies and employees, according to the Center for Work Life Policy. To help alleviate workers' tendencies of experiencing repetitive stress syndrome and carpal tunnel caused from working long hours, Workrite Ergonomics - a leading provider of ergonomic solutions for the workplace - introduces Workrite Glide at NeoCon World's Trade Fair, June 9-11, 2008, in Chicago. A first-of-its-kind keyboard platform, Workrite Glide is manufactured with a patent-pending design that offers the most extensive range of mouse platform positioning in the industry. Whereas other keyboard platforms are static - or adjustment requires awkward twists and turns - Workrite Orbit allows users to quickly and independently change the position, elevation and tilt of their keyboard and mouse. "The productivity demands placed on today's increasingly diverse workforce mandate that flexible, ergonomic solutions are provided for employees," says Dana Perkins, vice president of marketing for Workrite Ergonomics. "Solutions such as Workrite Orbit help meet this requirement, allowing workers to customize and adjust frequently used computer components to meet their ergonomic preferences, and can help stave off work-related discomforts and injuries." Ideal for commercial offices and multi-shift/multi-user work environments where ergonomic needs are diverse - especially among workers in the 5th to 95th percentile - as well as high-intensity mouse use applications such as CAD and graphic design, the adjustability of Workrite Orbit helps prevent the strain workers might otherwise feel if using static keyboard and mouse positions that are not conducive to their physical size and range of motion. 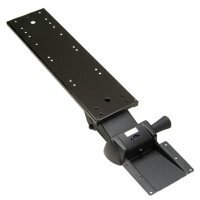 Providing unsurpassed, effortless adjustment of the keyboard platform and mouse surface, Workrite Glide is designed with a unique U-shaped track below the platform. 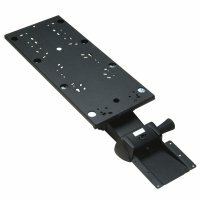 Featuring a revolutionary shaft and square axle design, this track enables the mouse platform to be simply pulled out, rotated and snapped back into place, eliminating the complex rotations, flips and similar adjustments usually required. 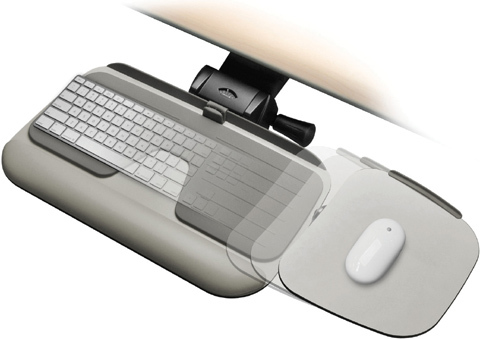 The sliding mouse surface can achieve four positions, each suitable to a particular body type: Mouse-Forward for individuals with average arm length, Mouse-Over for persons with shorter arms, and In-Line and Mouse-Back for individuals with longer reach. 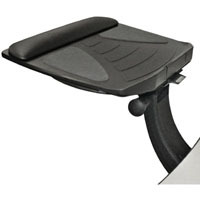 WorkRite 128 Wrist Rest: Palm support for use with existing keyboard trays and roll-out keyboard drawers. Question: Does this come with two mousing platforms or is each platform extra? Answer: This unit comes with one mousing platform. 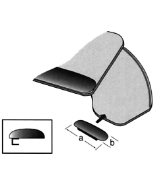 A second platform for the opposite side is available by selecting it in Option 4 of this product. Question: The space under my desk is about 25" wide. Will this tray fit? Answer: With a single mouse tray, you need at least 27" space. However we recommend another keyboard tray that is 25" wide.